Indianapolis has become the new City of Brotherly Love. It was reported earlier today that Antonio Rogerio Nogueira and Ryan Bader would co-headline UFC 119, and now it appears Big Bro will close out the September 25th show. MMAFighting.com confirmed with UFC president Dana White Thursday afternoon that both scraps will indeed go down inside Conseco Fieldhouse in Indiana. This marks the first time in company history where brothers will take the top two slots in a major Octagon event. Frank Mir handed Antonio Rodrigo Nogueira his second career TKO loss at UFC 92 in December 2008 en route to capturing the interim heavyweight title. 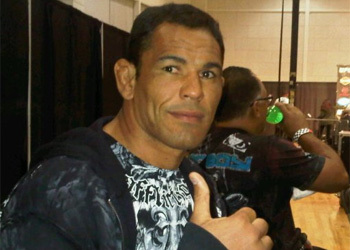 Many wondered why Nogueira appeared slow and sluggish prior to being stopped by Mir in the 2ndRound. Following the disappointing performance, reports surfaced that the Brazilian had suffered from a severe staph infection leading up to the bout. Nogueira was put down by up-and-coming Cain Velasquez in his last outing at UFC 110. The win earned the American Kickboxing Academy trained fighter top contender status to Brock Lesnar’s crown. Mir was steamrolled by Shane Carwin at UFC 111 this past March. He owns a 13-5 record overall, with eight coming by way of submission.